At least three people have been injured in an explosion at a building in Indonesia suspected of being used to prepare explosives, police say. 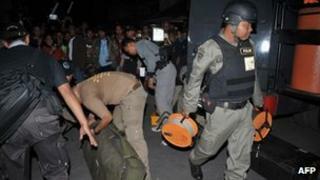 Two people are thought to have fled the scene after the blast in Depok, on the outskirts of the capital Jakarta. The blast comes days after police raided another house in Jakarta where bomb-making materials were discovered. In recent years Indonesia, the world's largest Muslim country, has battled violent Islamic extremist groups. One of the injured had 50-70% burns, according to police spokesman, who said bomb-making devices including grenades were also found at the building. "The explosion was so loud, it sounded like thunder. People shouted "Bomb, bomb!" and we all ran as fast as we could," on resident told the AFP news agency. Earlier this month, a raid by anti-terror police in the city of Solo left two suspected militants and one police officer dead.